What can and must be done to ensure there is decorum in the hallowed house? In this day and age we have ample tools and techniques that enable us to put anything the way it should be. It needs to be brought to light that these tools should be backed by human intervention, due commitment, thinking and initiative. Such as the credit rating system that we all know, once the entry level for politicians is set, a similar dashboard criteria with a ranking system can be monitored and evaluated throughout. This is to be on an independent, unbiased basis. We have so many M&Es (monitoring and evaluation) taking place in Sri Lanka and it really works if it is duly carried out. So why not for conduct of politicians? Law and order and discipline should be displayed first by the country’s rulers. If they are to make most things right, they have to set the country and its people on the right path. This is mandatory because those who display it first can lead others by example. However, this is the same aspect that has been undermined and misused. With regards to the rulers in Sri Lanka, most of their profiles cannot be accepted as right in terms of thought, behaviour and action. Neither are they suited to administer and represent the public. In today’s times, no politicians are role models. They’ve become symbols of disgrace and disruption. Remove all that are inferior. That is the solution to maintain decorum in the parliament! There has been a thaw in the chaos since the Supreme Court ruling on the wrongful dissolution of Parliament. But this could be because the MPs want something, like Cabinet Portfolios for example. Why else would they suddenly behave themselves? I would like to see new MPs in our Parliament but there will have to be elections for that to happen. Weaken the factors and forces that cause this present unfavourable political culture. Setting up the entry criteria for politics is one force. The behaviour of politicians should then be continuously monitored and evaluated which can rate them on how worthy they are. Other than natural reasons such as retirement or withdrawal, for a start off, a certain criteria can be set out for existing politicians. This is easier said than done and is a task to be carried out diplomatically because the prevailing setup is that the politicians hold the power, they have their say and a sudden change will pose a threat to them. This can be disastrous considering the nature, personality and overall calibre of politicians in this country. Consequently, even a topple in the government, harmful deals, unnecessary social and economic issues and increase in corruption may occur. Our inability to maintain decorum in the Parliament is the issue. When we look deep down, we can clearly see the reason it’s happening. We are disciplined by our culture, religion, education and mostly, by the example of our parents. When any of these are missing or neglected, the outcome is bad. Firstly, to get a party ticket to contest, you must be a tough person who can fight the opponent. For this you must have thugs around you and must have proven that you can eliminate your revilers one way or the other. You must be able and competent in hate speech. Only then will voters follow, cheer, clap and support you. If you are a soft-spoken, disciplined person you don’t get chances to even try to enter politics. This is happening everywhere including the local government assemblies. When this is the case, how do you expect decorum from such people? To maintain discipline and ensure decorum in the Parliament we have to implement the following standards without fail. There should be minimum educational qualifications for a person to enter into politics. Once nominated, he or she should undergo a screening process for further verification. Once selected to the Parliament, they must undergo an initial training for Ministers of Parliament. Further code of conduct should be strictly implemented and preserved within the Parliament. The Speaker must be given more power to control, and even call the security forces in case of emergency. We as voters too must be responsible enough to reject anyone who does not have the basic qualifications to enter politics. A code of conduct is the answer. Without a code of conduct in place, what else can the country expect other than these type of incidents, poor behaviour and disrepute? 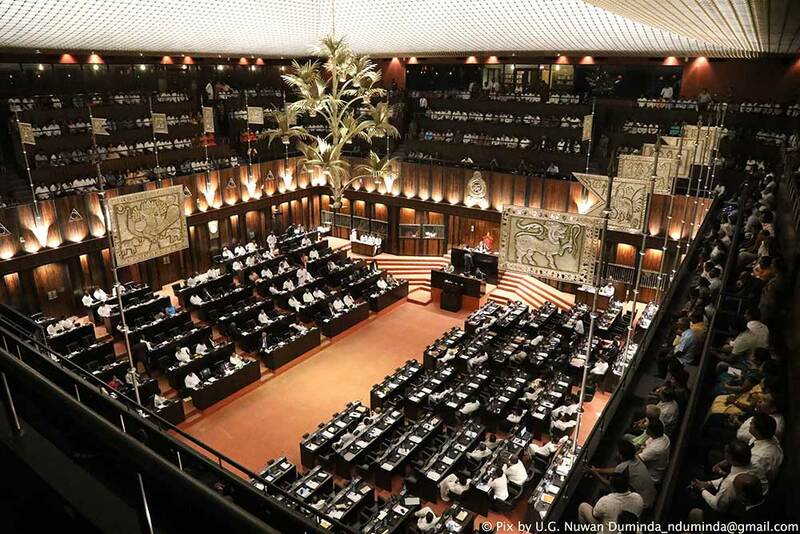 In previous instances too, certain inappropriate incidents have taken place in the parliament. However, as mentioned, there is no governing policy to prevent and keep away such politicians from appearing in the parliament. It should have been nipped from the bud. Had there been a code of conduct, it should have been used to regulate the conduct of politicians, at least within the parliament. The main reason is that there is no proper foundation for Sri Lanka’s politics and politicians, both. First and foremost, politicians need to get the basics right. And only then focus on the basics of excellence. The reason why the parliament has been a fighting ground is that there is no standard in the behaviour of politicians. It has become a place where anybody can come, do what they want and have an easy escape too. The outlook of any politician is that once they become a minister they can misuse their power as well. It is for this very reason that their ill manners are exemplified. The politicians have no dignity and it is from these eyes and these perspectives that they rate and behave in the parliament. Sack all the miscreants! They don’t deserve a place in Parliament leave alone society!